A house with a triangular window, a pool, and a central courtyard in the city of Nakhon Pathom. We were commissioned to design a house for a young doctor, his parents, and his dogs, a Great Pyrenees and a Syberian Husky. One of his request was to have an area for his parents to do gardening, a room for his dogs to sleep and a pool for them to swim. We planned to build the house around an inner courtyard and plant a lush amount of trees at the perimeter of the site and initially lay a plane of grass in the center. Techniques of construction adapted from our experience in Japan and the United States will be used for the project. 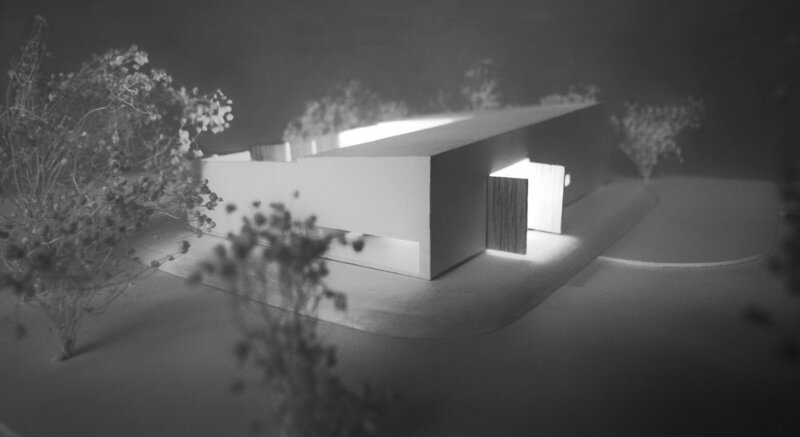 The house would be at the center of the site and have its own private garden. The wall at the pool and courtyard, a patterned wall with concrete blocks, slightly hovers through steel connectors to allow a more voluminous shape of light to pass through and a triangular window, reminiscent of the window at Kamigata Rakugo designed by Ando, opens the southeast corner of the house to welcome the sustained natural light of the morning sun.